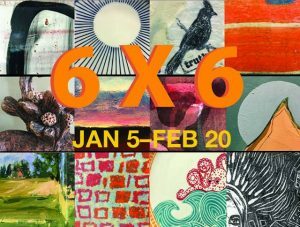 The Maine Crafts Association, in collaboration with Running with Scissors of Portland, ME, presents 6 x 6, an exhibition of small works comprising painting, sculpture, functional craft and mixed media. 6×6 was born at Running with Scissors and has been an annual one-day show and special sale held in conjunction with Maine Craft Weekend. This traveling installment of 6×6 includes work previously shown as well as new work and new artists.